When I moved home to Ohio in 2014, I didn’t intend to stay this long. I thought I needed six months or maybe a year to figure out where I was going next, but I certainly intended to go. I was going to move on, explore the world, and see things I had never seen. While I’ve had a few adventures during that time, I mostly feel like I have spent the last three years waiting for release and finding myself blocked at every turn. “What would you do if I asked you to stay?” God whispered into my soul. I’ll tell you what I did. I cringed. I squirmed. I raged against the very idea of staying in one place for too long. Why would He ask me to stay when I only ever wanted to go? I have always worn the word Fearless like the anthem Taylor Swift once penned it to be—plunging headfirst into the storm, dancing in my best dress. This was the image I had of myself. This was the girl I wanted to be. But at the beginning of 2016, God redefined this word for me. I was reading the conclusion to Laini Taylor’s Daughter of Smoke and Bone series. In this scene, Liraz—a most formidable warrior—watches over the two humans who stumbled into her world. She sneers at them because they are tiny and pathetic and out of place in a world at war. Well, I must have failed miserably at this missive because, at the beginning of 2017, He gave me another word: Together. No word in the history of mankind has unsettled me quite so much as the word Together. At least Fearless was still my battle cry, even if I was meant to redefine exactly what that meant to me. Together was something else entirely. I do solo rather well, thank you very much, and there was nothing within me that even wanted to pursue the implications of this word… which was exactly my problem and most certainly why God stapled it to me. So I attempted Together. Out of begrudging obligation, I made appointments and stuck with them even though I would have preferred to be elsewhere. Sure, there were exceptions. There were some really great moments with some truly wonderful people, but for the most part, I felt like I was colossally failing at Together. And then I met the Ropers. I’m still not entirely sure how this pack of brothers managed to fall into my life. All I know is that last summer they were just friends of a friend of a friend that my sister decided, for whatever reason, to reach out to on Snapchat. And the rest, as they say, is history. Her phone became her constant companion. And how could it not when she had four brothers and three of their friends blowing it up 24/7? I didn’t get it. Right up until the moment she got permission to bring some of her new friends on vacation with our family, I didn’t understand how, in such a short amount of time, these strangers she met on the internet could become her whole life. But there I was, celebrating my family vacation with three extremely affectionate brothers and their spunky female cousin. And so, my vacation that was meant to provide an abundance of much-needed personal space became in experiment in Together. But for the first time possibly ever, that wasn’t a negative thing. For the first time since I can remember, I actually wanted to be with these people more than I wanted to be curled up in my room with a good book. This is what people have in mind when they talk about Community, I thought. This is what Together is supposed to look like. I think that alone would have been a catalyst into a new way of living, but God (who had certainly realized that I was finally grasping this concept and was perhaps concerned I would lose it if He didn’t act quick) let me keep the Ropers a little longer. After Dad offered them some work, they’ve been mostly living with my parents off and on since October. And I thought, I get it now. I think I’m finally there. While I’m still the kind of Fearless that would dance in a storm in my best dress, I’ve realized that I’m not dancing alone anymore. There are other people out here in the storm with me and that is a beautiful, magical thing. I didn’t think it was possible for me to crave Together like a flower craves sunlight, but here I am. I have this friend—Katie. She’s nearly twenty and acts like the sassy little sister I never knew I wanted. She stayed at my apartment until 3:30am after a game night a few weeks ago and, as we were talking it dawned on me that I wanted those late night talks on a more consistent basis. I ended up asking her to move in with me. I guess it just seemed like the perfect culmination to my year of Together. So now I have a roommate, and I know it’s still early, but I’m finding it perfect. I miss her when she’s not around, which feels a little pathetic, but also kind of beautiful. I don’t know what this next year brings. I’m hoping for new horizons and the opportunity to travel more. But I know that whatever I do, I won’t be doing it alone anymore. We live in a world with amazing technology at our fingertips. Home can be transient. Together can stretch across miles as long as you know how to do it right. I’m still learning, but I think I’ve learned enough that I can finally give it a try. One minute I’m kicked back in my chair and the next I am scrambling upright, paying rapt attention to the book in my hands, trying to get closer to these words and the way they sing over this current season of my life. I’ve never been one to pick a word of the year, but I selected one quite by accident on the first day of 2016. I thought the word was Fearless, only redefined. The kind of Fearless that makes you Stay when all you really want to do is Pack Up and Go. 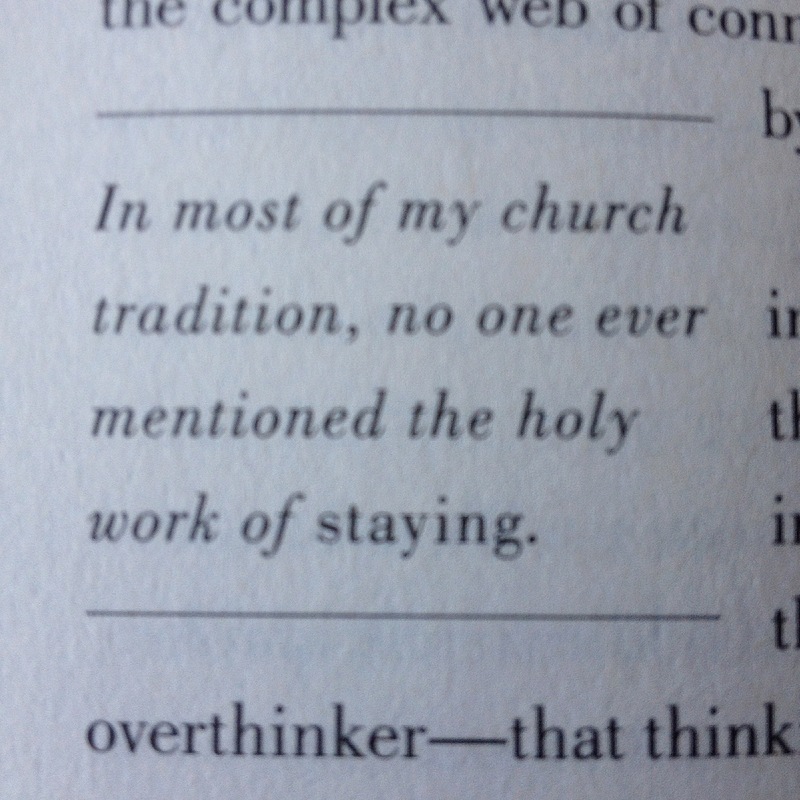 So I read on, wanting to know what else Sarah Bessey had to say about the holy work of Staying. “It’s a different kind of fearless,” she wrote. The girl who penned that blog post on the first of the year did not know what it meant to Stay. She knew Fearless only in the form of jumping on a plane and traveling to foreign lands and adventure is out there if only you are willing to chase it. Those things didn’t scare her the way they did many others. She felt quite content and at ease walking the streets of Mumbai and clasping hands with little, beggar children. But ask her to Stay… Ask her to Stay and she trembles like a leaf trying to free itself from its mother branch, hoping to abandon herself to the whims of the wind. Why would she want to remain anchored to the tree when she could go for a swim along a breeze? Hannah Brencher likens Staying to a monster that hides in the closet once you hit adulthood. She showed up in my inbox just this morning to remind me of how scared we all are of that word. And here I thought it was just me. Maybe you’re there with us. If so, welcome to the club. The worst thing we can ever do to ourselves is believe that it’s just us. That we are alone in the world. That no one else has words that they give teeth and claws. That no one else pulls the blankets up over their heads to hide from the monsters we fear. That the monsters are entirely our own and no one else finds them as terrifying as we do. Because this isn’t what I wanted for myself. I never wanted to unlace my world traveling shoes and settle into Smalltown, USA. But I stayed. Maybe I’ve been more begrudging than fearless, but I’m still here. And I’m showing up where I’m at, and being present in the moment, and learning to go deeper instead of wider. I’m realizing that maybe I don’t need to leave pieces of myself scattered across the globe; maybe I just need to throw my whole self into one place. Staying is the kind of ministry that takes a vulnerability I have never learned. But I am learning now. Slowly, but surely I am figuring out what it means to be the Staying Kind of Fearless. Even if, for now, that requires sorting through a whole bundle of fear. I received an end-of-the-year update from WordPress informing me that I wrote a mere fifteen posts in 2015. But, in spite of my record low numbers, the readership remained steady. Dear Readers, I am amazed by your faithfulness. I would have given up on me by now. While I am not one for new year’s resolutions, now seemed as good a time to start fresh as any. In fact, it feels long overdue. This year has been one of the darkest of my life. And I thought 2013 would be hard to beat. In 2013, I hit the rapids, but I still had God in my boat. In 2015, I kept trying to throw Him out because I didn’t like what He was saying. And, friends, let me tell you, it is really, really hard to brave the rapids without a guide. Liraz—most formidable of the angels—follows her brother’s lead and sides with the enemy. Liraz, whose arms are stained black with the tattooed tally of her victories. Liraz, who is feared by seraphs and chimaera alike. Liraz, who appears, in my mind, the very definition of Fearless. She stares at Karou’s two human friends who have stumbled into her world. Petite Zuzana and her violin-wielding boyfriend Mik have no wings, no fangs or claws, no place in a world at war. Weak, she thought, still watching the human pair. But there was another word lurking, defying it. Fearless. They slept with their faces touching. I read those words. Read them again and again, stumbling over this groundbreaking definition of Fearless every time. Fearless quite literally means lacking fear. I suppose that could be a lot of things. Still, it’s hard to imagine that Fearless can define both the warrior who strives against insurmountable odds and the teenage girl who sleeps peacefully in the arms of her beloved. It’s no secret that I have long been the girl who would stand alone on the battlefield. “Lord, send me,” has been the cry of my heart since I read the story of Amy Carmichael when I was eight years old. I would be perfectly content to wake up in a different country every month for the next year. In fact, I can think of little that would thrill me more than to have such an experience. But He hasn’t done that. And every time I’ve tried to force His hand on the issue, He closes yet another door in my face. “Can I please just go now?” I whine. I haven’t answered His question, mostly because I’m afraid to give it credibility. Like, if I answer this question, I have to acknowledge that He might actually be serious. Some people were made for staying, but not this girl. The world is too small in rural Ohio. I’ve felt it closing in, suffocating me. I miss the nations. I thought God and I had agreed this move was going to be temporary, but when I give it further thought, I realize God asked me to move and I consoled myself with the idea that it would be short-term. Just until I caught the travel bug and floated off to some other corner of the world. I, like Liraz, had my swords in hand and my wings unfurled for flight when God confronted me with this scene—this new definition of Fearless. That’s the kind of vulnerability that has the potential to undo you. “I want you to be Fearless,” God says. And though I’ve been toting that word like a mantra since Taylor Swift first put it to lyrics and God took my hand and dragged me headfirst—Fearless, I get the feeling He is asking something much different from me this time. Instead of dragging me headfirst into the storm, He is pushing me back down into my chair. But my feet are already twitching in time with the music and the rain outside looks like the dancing kind. I twitch. I squirm. I slink down in my seat. It’s the closest thing to an answer I can give Him right now. “Occupy this space. Be where you are. Invest in the lives of the people around you. Fall in love with as many strangers as you like, but keep them this time. Touch their faces. Let their faces touch yours.